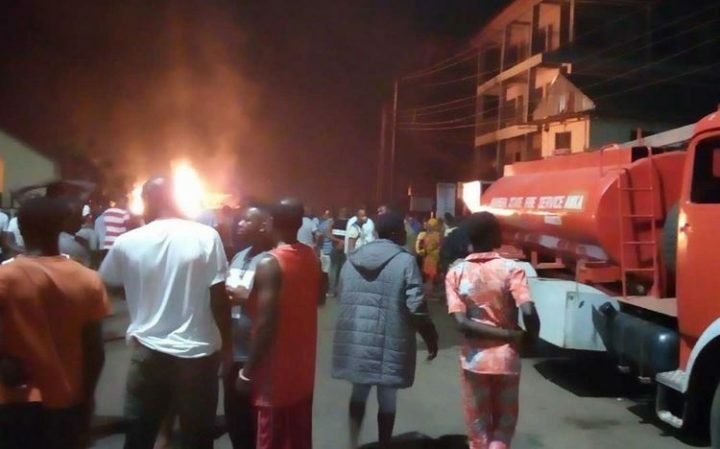 Not fewer than seven persons have been confirmed dead, following a petrol tanker explosion Saturday night, at Amawbia Roundabout, in Anambra State. The State Police Command’s Public Relations Officer (PPRO), SP Haruna Mohammed confirmed this on Sunday in Awka, noting that another injured person was currently under intensive care. ”So far, seven persons were certified dead at various hospitals by medical doctors while the only surviving victim was admitted at Intensive Care Unit of the University Teaching Hospital, Nnewi”, he said. According to Mohemmed, three of the bodies were deposited at Amaku General Hospital morgue, Awka, two at Regina Caeli Hospital, Awka and another two at Piston Hospital morgue, Awka. 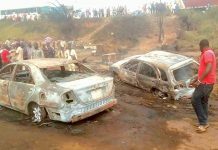 He highlighted that postmortem examination would still be conducted to ascertain the exact cause of their deaths; even as sympathizers were still thronging the scene of the incident, to catch a glimpse at burnt vehicles, buildings and other valuables affected by the fire as at press time. An eye witness, Mr Ilu Ali, a vegetable dealer in Awka, said that six of the victims were known to him. “Six persons who died as a result of the fire are northerners, and I know all of them, we were together before the fire started yesterday night. ”Those killed were Sabo Jigawa, Hamza Jarowro, Adamu Mohammed aka Janari, Dansoho, Malam Malam, and Jinjiri (from Garzawa, Kano),” he said. Ali said that apart from the dead, four other victims who sustained injuries were at Amaku Teaching Hospital, Awka and a private Hospital, Felly in Amawbia area. He revealed that the victims were affected because the petrol from the tanker flowed through the water channel to a spot where they were roasting suya meat. Meanwhile, some consumers in the Federal Capital Territory (FCT), have commended the Federal Government for assenting to the Federal Competition and Consumer Protection Bill. The consumers on Sunday in Abuja, urging the federal government to further empower the Consumer Protection Council to be able to prosecute also. President Muhammadu Buhari had on Wednesday assented to the Federal Competition and Consumer Protection Bill, thereby, making it a Federal Competition and Consumer Protection Act 2019. The CPC Director-General, Mr Babatunde Irukera, while announcing the decision by the President said the bill would promote consumer confidence, choice and fair pricing. “By this law, the Federal Government has cemented the most needed efficient and transparent framework. “It will ensure meaningful and credible disposition of public enterprises, expanding economic growth and assuring shared prosperity. “As a leading market in Africa, a vibrant competition framework is a key tool in reducing poverty, increasing value for money and ensuring consumer satisfaction. A consumer, Mrs Aisha Kabir said consumers in the country were not being treated as they should, therefore, government’s decision to assent to the bill would be very beneficial to consumers. Kabir, a civil servant, said the CPC from what she had gathered, had been doing so much for consumers but the capability of the council was limited. She urged the government to adequately empower the council to prosecute offenders of consumers’ right to deter other offenders. 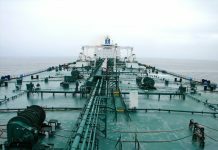 Mr Julius Amaechi, a businessman, said the decision by the government was a welcome development for consumers. According to Amaechi, the economy situation now is not so favorable for Nigerians because many people barely make ends meet so any decision that will control the price of goods is welcomed. “I am a businessman and my aim is to make profit but that does not stop me from being inhuman and rational. Mrs Stella Oranuka, a consumer said she and some other colleagues purchased some items which from observation were of inferior quality. “We have complained to the distributor concerning the items and are hoping something will be done soon about it. Some consumers, however, urged the CPC and the government to increase awareness on the importance of the council so Nigerians would be more aware and get redress when necessary. Miss Ekaite Bassey, a petty trader, said she bought some goods from a client only to discover they were of very poor quality and so people refused to buy the items. “When I complained to the client, he said there was nothing he could do as he did not produce the goods. Another consumer, Mr John Onuja said “I am aware the CPC is doing a lot regarding awareness to the public on its mandate but I think they have to do more’’. Previous articleIn the lighter mood: Sharing Secrets before Praying!